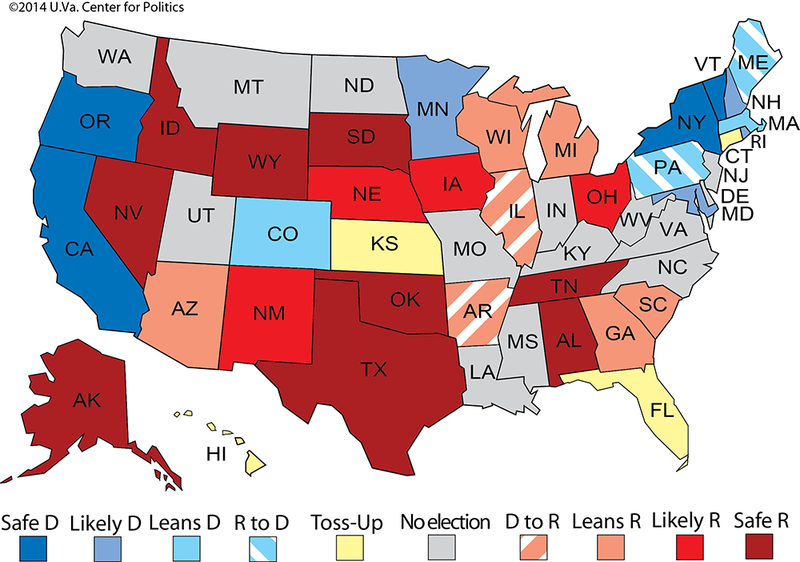 Larry J. Sabato's Crystal Ball » What’s the Matter with Kansas — and Hawaii? What’s the Matter with Kansas — and Hawaii? Royal Blue Hawaii and Ruby Red Kansas are two of the most predictable states in presidential and Senate elections. Yet both states have incumbent governors from the dominant parties who are fighting for their political lives. What gives? The 2014 gubernatorial map features a number of fascinating races, some of which — like Hawaii and Kansas — defy the partisan conventions of this highly polarized era. To understand the difference between the gubernatorial contests and the Senate races, just remember the basic distinction between the two offices: governors act and achieve while senators talk and vote. As a consequence, some slice of the electorate is inclined to judge Senate and governor incumbents in distinct ways. Voters naturally link their senator with his or her national party and its federal ideology, which is increasingly uniform (liberal or conservative) for Democrats and Republicans. There is a kind of triangulation or correlation that takes place in many voters’ minds — the party ID of the senator, the party ID of the resident of the White House, and a voter’s own views of the senator’s party and the president’s party. Challengers help voters make these connections by using the best tangible record of a senator’s tenure — the specific committee and floor votes he or she has cast. These roll call votes increasingly matter since appropriation earmarks — in earlier times, a way for senators to build goodwill beyond their party members — have gone the way of the dodo. Federal and state party affiliation and ideology are more alike than at any other time in the modern era — Democrats everywhere lean left and Republicans in all states tilt right — so naturally party and ideology have major impacts on gubernatorial outcomes, too. Nonetheless, many voters seem to apply a state-based slant to the gubernatorial questions they pose: “Has my governor made tangible accomplishments during his or her time in office? Do I feel comfortable with his or her leadership style and executive record? Is my state moving in the right direction or not?” Thus, a skillful governor might be able to get beyond pure party labelling by means of bricks-and-mortar successes, or sensible rubber-meets-the-road policies in education, transportation, mental health, and so on. This perspective helps to explain why we are seeing less movement in gubernatorial races than in the battle for Senate control, and why some of the statehouse contests are anomalous. In 21 states where Democrats occupy the governor’s mansion and 29 states where the current tenant is a Republican, the Crystal Ball currently projects no net change in overall party control. With our latest ratings changes, a mere four of the 36 states electing a governor this year can be called true Toss-ups as of now (Connecticut, Florida, Hawaii, and Kansas). In another seven states, the governor or the candidate of the incumbent party is ahead, but is not out of danger of defeat: Arizona, Colorado, Georgia, Massachusetts, Michigan, South Carolina, and Wisconsin. (We’d bet most of these candidates will nonetheless end up winning in November.) We also are currently projecting four party switches, though they even out at two apiece for each party: Republicans are slight favorites to win back Arkansas and Illinois, while Democrats have at least some edge in Maine and Pennsylvania. Arkansas: In a battle of two former members of the U.S. House, Asa Hutchinson (R) has built a small lead in the polls against Mike Ross (D) in the Natural State’s open-seat contest. Should Hutchinson win, it would mark a turnover from the Democrats as incumbent Gov. Mike Beebe (D) is term-limited. Arkansas has moved very sharply toward Republicans in recent years at the federal level, though Sen. Mark Pryor (D) is trying to buck this trend in the state’s Senate race this cycle. But the GOP has also made significant gains at the state level, taking full control of the state legislature in 2012 for the first time since Reconstruction. With Hutchinson’s polling lead and the increasingly Republican proclivities of Arkansans, we’re moving it from Toss-up to Leans Republican. Hawaii: Gov. Neil Abercrombie (D) is so personally unpopular that he will be lucky to survive the Democratic primary against state Sen. David Ige. In fact, Democratic pollster Public Policy Polling recently found Ige leading Abercrombie 49%-39%, though any survey in the notoriously-difficult-to-poll Aloha State must be treated with caution. That said, we’re hearing that the public polls in Hawaii might not be far off the mark, and that Abercrombie is in real trouble heading into the Saturday, Aug. 9 primary. Even if Abercrombie wins renomination, he may well falter in the general election matchup against his 2010 general election opponent, former Lt. Gov. Duke Aiona (R). Moreover, the independent candidacy of former Honolulu mayor Mufi Hannemann, an ex-Democrat, will further complicate things. This race shifts from Leans Democratic to Toss-up, and the primary is a Toss-up, too. We still favor Sen. Brian Schatz (D) in his primary against Rep. Colleen Hanabusa (D): Abercrombie’s appointment of Schatz to deceased former Sen. Daniel Inouye’s (D) Senate seat, against the deathbed wishes of the Hawaii legend, is contributing to Abercrombie’s troubles with his own party, but perhaps isn’t hurting Schatz in the same way. (What was Schatz supposed to do — turn down the appointment?) Schatz also lacks Abercrombie’s grating style. Both primaries will be very much worth watching. Illinois: Gov. Pat Quinn (D), barely elected to his first full term in 2010 and hampered by a poor state economy and budget problems, appears to be losing so far to a wealthy Republican, Bruce Rauner. Quinn’s narrow win in 2010 happened in part because his opponent was very conservative, too much so for Illinois even in the midst of a gigantic Republican wave that cycle. However, this time Quinn faces an “outsider” opponent in Rauner, who is promising to clean up the mess in Springfield and who can also self-fund his campaign to a large degree. While this race could well shift again this cycle, we’re now moving it from Toss-up to Leans Republican. We’ve heard a lot of pessimism from Democrats about Quinn’s odds, though they hold out hope that he can pull the rabbit out of a hat once again. He might, but he’s down right now — and facing a better candidate, Rauner, than he did last time. According to Politico’s Kyle Cheney, Quinn would be the first governor from the president’s home state (and of the president’s party) to lose reelection since 1892. Kansas: Freshman Gov. Sam Brownback (R) has proven so controversial and alienated so many traditional, moderate-conservative Republicans that, somewhat incredibly, the GOP candidate in Kansas, of all places, is struggling to retain his office. Amazingly, the incumbent has trailed in most polls to state House Minority Leader Paul Davis (D), and reports coming out of the Jayhawk State signal that Brownback could actually lose. The incumbent has barely outraised his challenger so far this year, and only did so by way of a $500,000 loan from his running mate; without that assistance, Davis would have raised $370,000 more than Brownback in that time. We are shifting this contest from Leans Republican to Toss-up. Kansas is so Republican that we won’t be surprised if this one teeter-totters back in Brownback’s direction — but the governor has a lot of fence-mending to do, and quickly. Wisconsin: Despite winning his first contest in 2010 and then triumphing again in a bitter 2012 recall election, Gov. Scott Walker (R) of Wisconsin is no safer in the competitive Badger State this year, and he has a tight race against Madison school board member Mary Burke (D). Walker’s expected presidential run in 2016 is also on the line; a loss would very probably eliminate him from consideration for his party’s nomination. While Walker remains the favorite, this race moves from Likely Republican to Leans Republican. It has probably struck you that several of these ratings are out of partisan character for their states. Hawaii was President Obama’s strongest state in 2012 (70.5%), yet the incumbent Democrat he’s openly supporting could go down. Illinois is the state Obama now calls home and is deeply Democratic; still, the president’s party could see its governor tossed out (just as Democrats lost Obama’s own Senate seat to Republican Mark Kirk in 2010). Rock-ribbed, deep Red Kansas was Mitt Romney’s tenth-best state (59.7%) and hasn’t voted for a Democratic White House nominee since Lyndon Johnson in 1964. Yet Brownback — who also served as a U.S. senator for a little over 14 years — appears to be in real trouble. Perhaps all three of these incumbents will manage to eke out victories in November, but their paths are certainly not being strewn with rose petals. Colorado: Following his primary victory in June, 2006 gubernatorial nominee and former U.S. Rep. Bob Beauprez (R) is now tied or nearly tied with Gov. John Hickenlooper (D), if a few recent polls are to be believed. Just as with the highly competitive Senate race here, we’re holding this race as Leans Democratic, for the same reasons we outlined in our Senate update last week. One thing that seems possible, though, is that Hickenlooper and Sen. Mark Udall (D-CO) will run fairly close together in November after it seemed for a while that Hickenlooper would run noticeably ahead of Udall. Minimal crossover voting in the gubernatorial and Senate races makes sense in a partisan and polarized era. Also, Hickenlooper and Udall are both well-known incumbents from the same party: There probably aren’t many thousands of voters that will support one but not the other. However, the Leans Democratic rating in both big statewide races is right on the edge. It’s quite possible that swing state Colorado could deliver two really big victories to Republicans this fall. Florida: No one is going to be eager to call the volatile match-up between Gov. Rick Scott (R) and former Gov. Charlie Crist (D), which may also go down to the wire. Yet it is worth noting that Scott has been running a more disciplined and better-funded campaign than Crist, and that he has made up much of a large polling deficit with the Republican-turned-Independent-turned-Democrat. Scott looked like the walking dead for much of his first term, consistently unpopular, but his team is doing an impressive job, so far, of engineering a potential resurrection. Georgia: Gov. Nathan Deal (R) ought to be a lock for reelection, but he’s not. The former head of the state’s ethics commission claims Deal’s office pressured her to dismiss complaints about Deal’s 2010 gubernatorial campaign. State Sen. Jason Carter (D), President Jimmy Carter’s grandson, is giving Deal fits. The Peach State’s changing demographics are also helping Carter (and Democratic Senate nominee Michelle Nunn), though we still give Deal and Republican Senate nominee David Perdue a modest advantage. Any more shocks from the Deal administration could change those odds, however. A runoff is also possible if no candidate tops 50% — just as in the Senate race. Massachusetts: We’re keeping this rating at Leans Democratic for now, which is where most Bay State contests start. It looks like Attorney General Martha Coakley (D), most famous for blowing a 2010 special Senate election against Scott Brown (R), will be the nominee here. She’s very capable of snatching defeat from the jaws of victory yet again, perhaps to the benefit of Charlie Baker (R), who lost to outgoing Gov. Deval Patrick (D) four years ago. Massachusetts has no qualms about electing Republicans as governor: GOP chief executives ran the state for 16 straight years before Patrick’s 2006 victory. Michigan: The Wolverine State is fairly Democratic, and it is difficult for any Republican to win a statewide election here, much less two (though easier on the state than federal level). Gov. Rick Snyder (R) rode his party’s wave to the governor’s mansion in 2010. Although we still lean the November election to him, ex-Rep. Mark Schauer (D) has kept the contest within striking distance. Snyder isn’t going to be able to use cruise control to win. One other point: Michigan, like Colorado, features a Senate and a gubernatorial race this year. We’re calling the open-seat Senate race between Rep. Gary Peters (D) and former Secretary of State Terri Lynn Land (R) “Likely Democratic,” but we still favor the incumbent Republican governor. Nonetheless, how far will Peters and Schauer, the Democratic nominees, be separated in the vote tallies on election night? Probably not as much as many might think. The prospect of coattails from Snyder gave some hope to Land earlier this cycle: Now, could Peters provide some coattails to Schauer? It’s worth considering even as our ratings indicate a split decision in this state, with the Democrats favored in the Senate seat and the incumbent Republican leading in the gubernatorial battle. Nebraska and Oklahoma: We’re grouping these two deeply Republican states together because we don’t want to dwell on them; rather, we just want to put them on readers’ radars. In Nebraska, 2006 Senate nominee Pete Ricketts (R) might not have an entirely clear path to the governorship against former University of Nebraska regent Chuck Hassebrook (D). And in Oklahoma, a couple of polls have shown state Rep. Joe Dorman (D) within striking distance of Gov. Mary Fallin (R). The polls and our instincts do not coincide in these races, and for now we’re sticking with our instincts. While we are watching closely, our ratings stay the same: Nebraska (Likely Republican) and Oklahoma (Safe Republican) for now. Pennsylvania: Only the powers of incumbency and the Keystone State’s tradition of consistently giving the incumbent party eight years of control before shifting parties is keeping first-term Gov. Tom Corbett (R) at a Leans Democratic rating. That may be too generous to the incumbent. Corbett is in deep, deep danger of losing to Tom Wolf (D), a wealthy businessman and former state official. Overall, we aren’t looking for any sizable net change in the statehouses come November. The incumbents who lose will grab the headlines, perhaps giving a false impression that a wave has swept across America. A wave is still a possibility for the Senate, though we recently stressed that the waters are calmer than expected at this point. The Crystal Ball expects a small net statehouse shift of anywhere from +1 Republican to +2 Democrats. This is a slight improvement in the odds for Republicans: Our previous outlook was +1 to +2 Democrats. In any event, the history books are very unlikely to record any gubernatorial turnover records in 2014. Look at Map 1 below. To reiterate, both parties are now favored to flip two statehouses apiece: Pennsylvania and Maine for the Democrats, and Arkansas and Illinois for the Republicans. Then, each side has two Toss-ups to defend: Connecticut and Hawaii for the Democrats and Florida and Kansas for the Republicans. However, the Democrats still have many more credible targets than the Republicans: There are five Republican-held seats rated as Leans Republican, while only two Democratic-held seats are rated Leans Democratic. The playing field is bigger for the Democrats, but it is uncertain whether they will end up chipping away at the Republicans’ 29-21 net edge in governorships.